The mini-hotel "By the Sea" is located next to the Massandra beach, just a 5-minute walk from the promenade. There are 6 cozy, comfortable rooms of "junior suite" and "lux" class. Each room of the hotel "By the Sea" is equipped with comfortable modern furniture, a TV, a refrigerator, a shower cabin and a bathroom. Free Wi-Fi is available. All rooms have a balcony overlooking the sea and mountains, some rooms have a fully equipped kitchen. 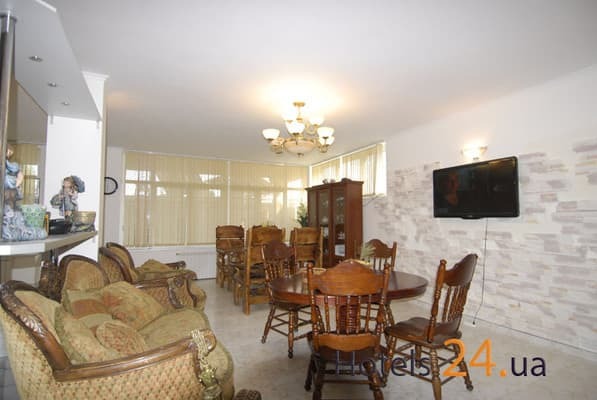 On the 1st floor there is a kitchen-dining room with a complete set of utensils and appliances. On the top floor of the mini-hotel there is a spacious terrace for rest. Near to hotel there is a paid parking place. In walking distance from the hotel there are many restaurants, shops and cafes. The distance to the bus terminal of Yalta is 2.9 km. PRICES MAY CHANGE, IT IS REQUIRED TO RECEIVE INFORMATION FROM THE OPERATOR. Description of the room: The windows offer a beautiful view of the mountains and the sea. 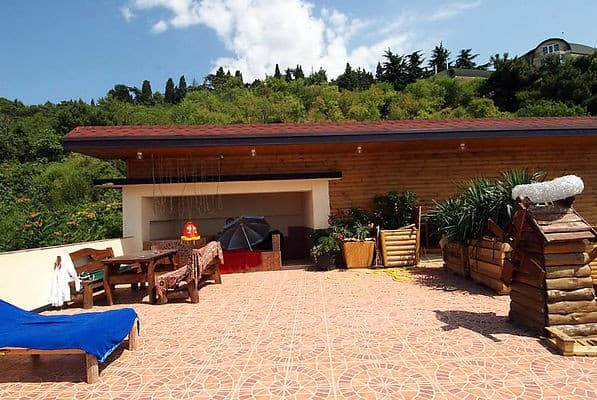 You can enjoy the scenery from the balcony or the shared terrace. 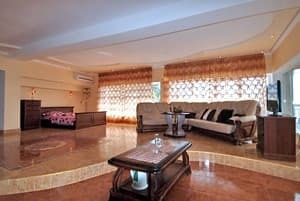 The room has a double sofa and a soft leather corner, air conditioning, a common spacious kitchen on the 1st floor (microwave, coffee maker / electric kettle, dishwasher, refrigerator, washing machine). The room can accommodate from 2 to 5 people. Description of the room: The design of the room is made in a modern youth style with large panoramic windows. From the balcony there is a beautiful view of the Massandra beach. 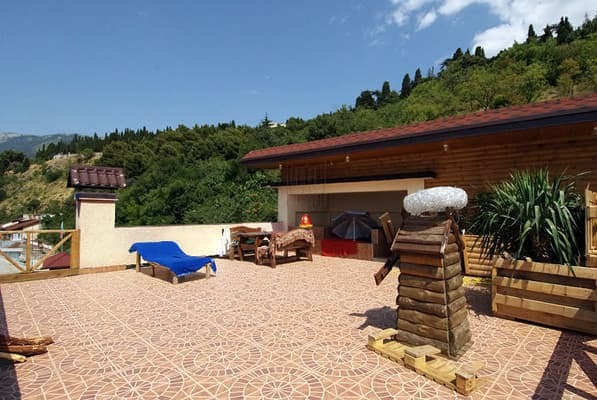 In the room: new furniture, double bed, sofa, air conditioning, bed linen, hairdryer, iron, TV in the kitchen and in the bedroom, refrigerator, gas stove, microwave, electric kettle, new dishes, hot and cold water round the clock. 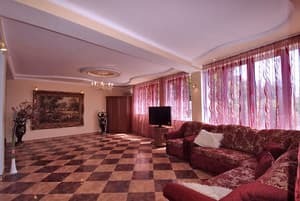 Description of the room: The room has a large double bed and a sofa bed, bedside tables, TV. Bed linen and towels. Shared kitchen on the first floor. The room has a balcony with a view of the sea. Accommodation 2-4 people. 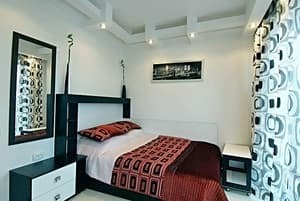 Description of the room: The room has a double sofa and a soft leather corner, air conditioning, a common kitchen area of ​​22.7 square meters on the first floor with all accessories (microwave, coffee maker / electric kettle, dishwasher, refrigerator, washing machine). Description of the room: One-room double room. The windows offer a picturesque view of the sea, the mountains and the embankment. 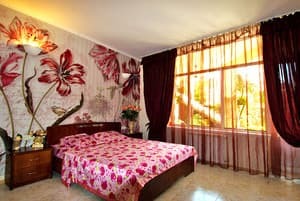 The room is equipped with everything necessary: ​​a large double bed, a spacious bathroom, air conditioning, TV. On the 1-mm floor there is a common large kitchen (38 sq.m). In the kitchen: microwave, coffee maker / electric kettle, dishwasher, refrigerator, washing machine. Description of the room: The windows offer a beautiful view of the sea and mountains. 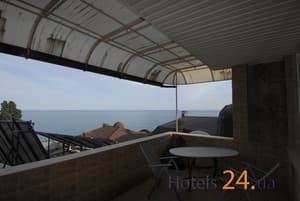 The room has air conditioning, a balcony overlooking the sea. Fully equipped common kitchen on the 1st floor (microwave, coffee maker / electric kettle, dishwasher, refrigerator, washing machine). 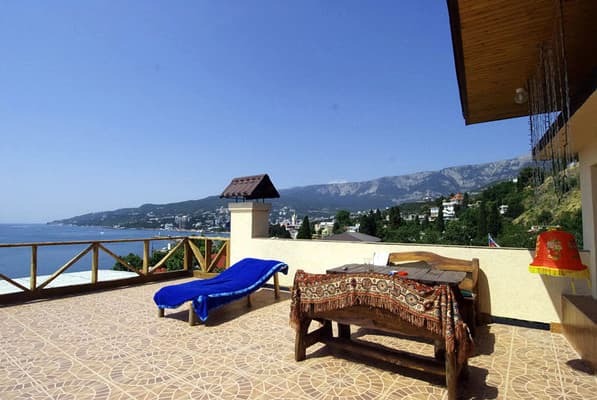 Terrace on the top floor with a picturesque view of the promenade, the sea and the mountains. The room can accommodate from 3 to 4 people. The mini-hotel "By the Sea" is located next to the Massandra beach, just a 5-minute walk from the promenade. The distance to the bus terminal of Yalta is 2.9 km. From the railway station of Simferopol on any transport to Yalta. There is a transfer from the Yalta bus station (the service is free).